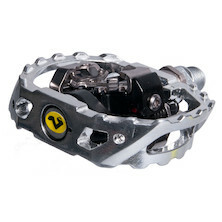 Choosing the right pedal for your mountain bike riding mainly depends on one decision - how much pedalling are you likely to be doing? If you favour more downhill, technical variants, then flats are the obvious choice. In it for speed, or a penchant for going uphill? 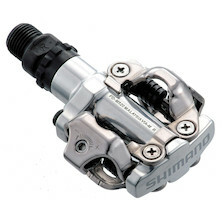 Get hold of a clipless system. Of course, saying all that, it’s not really that simple. The correct choice of pedal depends mainly on your preference from trying different systems (often one after the other) until you find the right one. Luckily we have a wide range in stock from the biggest manufacturers out there, including Shimano, Crank Brothers and Look. Stop Press: for you flat pedal fans out there, we have something special in the works, via On One HQ. Those local to Sheffield will appreciate the reference, no doubt. Presenting... the Park Hill Flats.